The Fellowship was fortunate enough to obtain a copy of THE OCCULTIST #1 from Dark Horse Comics. Tim Seeley writes and Mike Norton draws. Rob Bailey is just an ordinary college student – with a powerful magical artifact. He’s still learning what The Sword does, and what he can do with it. He also helps people out when things turn weird, and he does his best to protect his friends. One of his friends is a cop, and he’s starting to fall for her. And another friend is subtly trying to manipulate him to get The Sword away from him. And those are only the beginning of his troubles. Modern fantasy is pretty hot right now, and there’s plenty out there. But Rob is a really likable character; he’s got normal problems to go along with the supernatural ones, and it’s easy to root for him. And he’s not the only likable character. There are also lots of story layers set up in this book. The art is really well done, too, especially the distinctions between the real stuff and the weird occult goodness. This title already has a great deal of good characters and mysterious story working for it. It’s a really nice package, and I’m looking forward to seeing more. 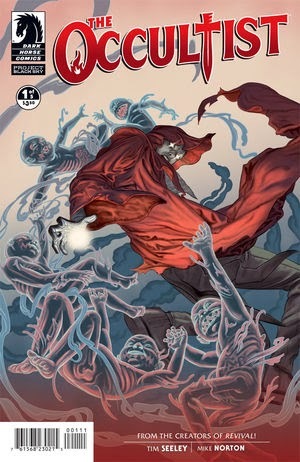 THE OCCULTIST #1 is available now at your LCS and online at darkhorse.com.